We have all heard a lot in the past couple of years about Bio-Ethanol and how it has become a viable alternative to gas, electric or solid fuel fires, but where does it come from? What Is It? We take a look at Bio-Ethanol and where it comes from. Bioethanol has a number of advantages over conventional fuels. It comes from a renewable resource i.e. crops and not from a resource that will eventually run out such as oil and gas and the crops it derives from can grow well in the UK (like cereals, sugar beet and maize). Another benefit over fossil fuels is the greenhouse gas emissions. By encouraging bioethanol’s use, the rural economy would also receive a boost from growing the necessary crops. Bioethanol is also biodegradable and far less toxic than fossil fuels. The main sources of sugar required to produce ethanol come from fuel or energy crops. These crops are grown specifically for energy use and include corn, maize and wheat crops, waste straw, willow and popular trees, sawdust, reed canary grass, cord grasses, jerusalem artichoke, myscanthus and sorghum plants. There is also ongoing research and development into the use of solid wastes to produce ethanol fuel. Ethanol or ethyl alcohol, to use its full name, is a clear colourless liquid, it is biodegradable, low in toxicity and causes little environmental pollution if spilt. Ethanol burns to produce carbon dioxide and water, making it ideal for houses without a chimney, but want that living flame. The following are some of the most frequently encountered problems which are the result of inefficient or deteriorating chimneys. Read about some likely causes for these problems. Large uninsulated flues require a lot of heat and fuel to make them draw. In particular high efficiency modern appliances have only a relatively small outlet pipe for the fumes. If these discharge into a much larger uninsulated flue, their rise can be decelerated to the point when the appliance just will not draw. 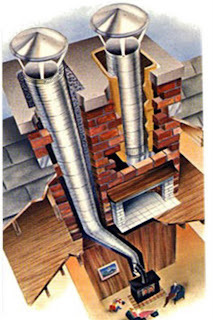 An insulated flue or flue liner of the correct size is required to ensure that an adequate draught is created for them to burn as their designers intended. Otherwise they will use too much fuel and the slow moving fumes will also condense into acids which will attack the internal surface of the chimney. Bringing life into a living room, fireplaces not only provide warmth but bring a cosy glow into the room. Electric fireplaces offer both of these without having to burn gas, wood or coal. Ideal for those possibly without a chimney or gas connection! 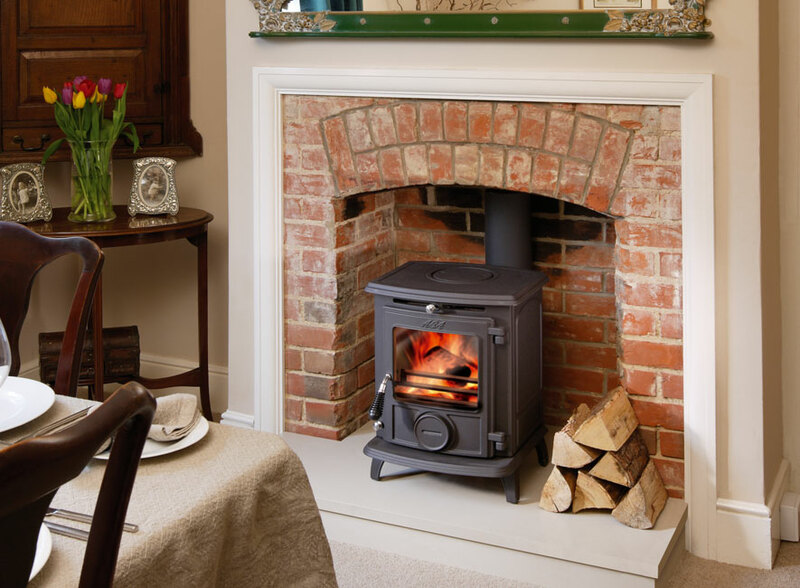 With a design based on the classic wood-burning stove, the electric stoves version is both versatile and practical, making them a very popular choice. The realistic flame effect is enhanced by the real looking coal or log fuel bed, and the fire itself can either be hearth-mounted or positioned on the floor. Unlike a real fire, the brightness and heat can be adjusted to achieve just the right effect to suit your home. With Electric stoves ranging in appearance from MDF with a Cast-Iron effect, to authentic cast iron electric stoves. These fires can be fitted into a fireplace opening or secured flat against a wall. 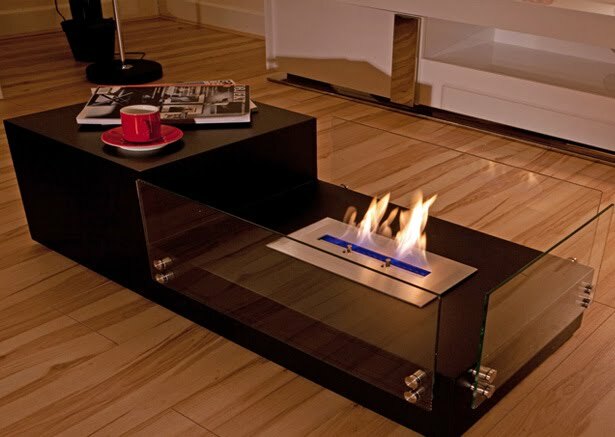 Inset electric fires are ideal for replacing an old gas or electric fire within an existing fireplace. They also work well in conjunction with a surround set. 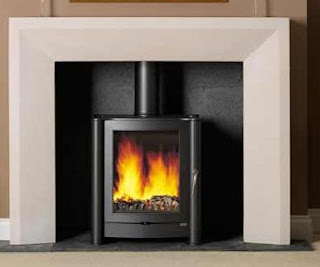 Like the electric stove, the inset fire has a realistic flame effect, along with a coal, log or pebble fuel bed. These fireplaces have a more modern design than traditional fireplaces, making them perfect if you don't have enough space for a surround set. Being wall-hung, these fires don't need to be placed within a fireplace opening, which means you can put them wherever you like in your room. 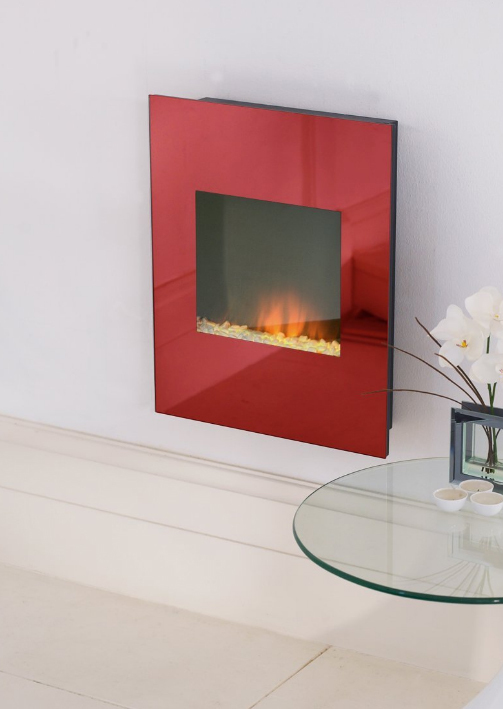 These stylish and practical fires are available in an incredible range of styles and finishes, ranging from Black Glass to Mirrored Glass and even to stone effect. A fireplace makes a room feel more welcoming and with a surround and mantelpiece you can complete the look. These fireplaces feature real wood veneers and marble-effect back panels and hearths, for a classy and traditional style.Electric Suites are now available with an electric stove. The amount of heat your electric fire generates will depend on its power, which is measured in kilowatts, The most heat you will normally get from an electric fire is 2kW, this is because they traditionally all use a standard 13-amp socket you have at home. Most fires are fan assisted and often have several heat settings. The no-heat setting gives the atmospheric flickering glow of a fireplace without the heat. Some models can even be remote controlled for added convenience. I Want A Flueless Gas Fire, What Do I Need? Flueless gas fires require an air vent in the wall to provide a natural source of fresh air. The myth is that this will cause drafts. Modern air vents are designed not to cause drafts and have a shield on the outside. When choosing a vent for your home to go with your flueless gas fire always select a high quality vent. Vents such as the 'Black Hole' Vent consist of a series of baffles that reduces direct drafts and also reduces any noise that could travel through the vent. The size of the vent depends on the kW rating of the fire. The minimum is 100cm2 of "free air". The larger the kW rating of the flue-less gas fire the larger the vent. 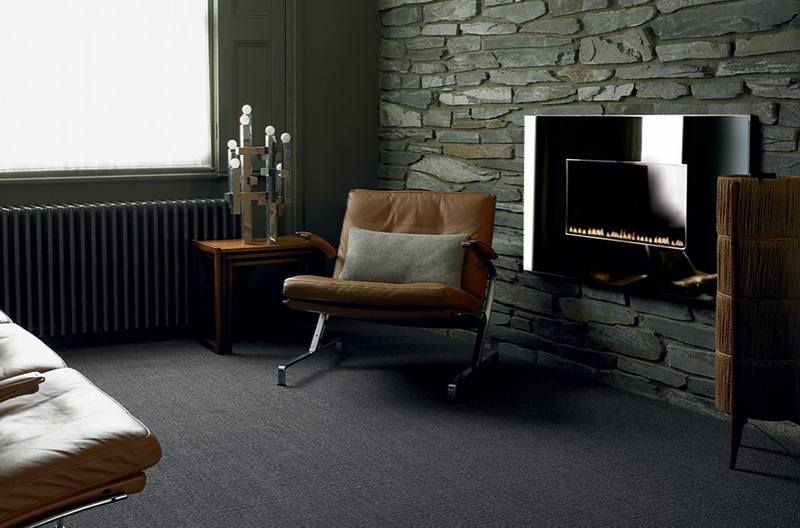 Every flueless gas fire has a "minimum" room space that it can be allowed to be installed in, e.g. 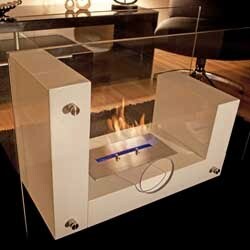 30m3 in the case of the Acquisitions X-Fire 1000 Flueless Gas Fire. This is quoted by the manufacturer as the minimum volume based on width x height x depth in cubic metres. 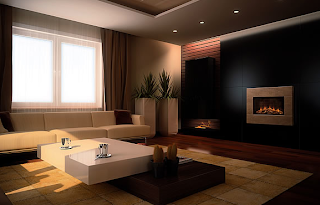 As long as the room is the same or larger than the minimum, the fire can be installed. This is based on the heat output of the fire, the larger the Kilowatt rating of the appliance the larger the room needs to be. While a flue-less gas fire could look stunning in the kitchen, it is not normally recommended by manufacturers. This is due to the high content of moist air in this type of room that will be drawn into the appliance. Flueless Gas Fires are designed to provide a secondary heat source only and cannot be used as the only form of heating in the room. There are strict rules regarding recessing of a flueless gas fire into the wall and placing objects above them. Check the technical specification or discuss with your local retailer. While the Verine Eden Hole In The Wall Gas Fire certainly looks the part in a contemporary living space, it used to look out of place in a more traditional living space. However this is no longer the case, thanks to OER, the Verine Eden is now available as part of a stunning Limestone Suite, shown below. Now the Verine Eden can look stunning in both a modern or traditional setting. Still offering the same high efficiency of the Frameless Eden the Limestone Suite offers a heat output of 5.5kW and is suitable for a conventional flue. And supplied with a choice of fuel effects the Eden Limestone suite would be perfect for those looking for a landscape fire, but perhaps with a more traditionally styled home that would not accommodate the frameless fire. Featuring the now standard safety features including an Oxygen Depletion Sensor and Flame Supervision Device to go with the remote control, making operation of this fire both very safe and a very easy fire to operate from your armchair. Lincolnshire fire chiefs are reminding households with open fires and wood burning stoves how important it is to have chimneys checked and swept to reduce the risk of fire. Chimney Fire Safety Week runs from September 21 to 27, now being the time of year to get chimneys ready for the colder months ahead. With a growing number of households now using open fires and wood burners, Debbie Robinson, Lincolnshire's deputy community fire safety manager, says: "In order to keep you and your family safe from fire, you need to take necessary steps such as ensuring your chimney is swept regularly, depending upon what fuel you burn, and I would urge all householders to have a working smoke alarm in their home. "Over the past year we have attended 146 fires which started in a chimney, five of which developed into house fires, and many could have been prevented had suitable precautions been taken. "On one occasion the property owner was alerted early to a fire by the smoke alarms that we had fitted only a few weeks earlier which allowed her to raise the alarm very quickly." For free advice call 01522 582222. As suitable originals became scarcer, they set about the ambitious task of replicating Victorian cast-iron fireplaces, and were proud to lead the way in restoring the period mantelpiece to its rightful place in the British public's consciousness. Today, the Acquisitions collection of ‘continuations’ – the word ‘reproductions’ does not do their products justice, since they are so faithfully recreated using authentic skills, techniques and materials – is one of the finest and most comprehensive in the world, encompassing every material from marble to cast iron, and every style from Georgian to modern-day. While notable clients have included pop stars, film icons and denizens of 10 Downing Street, The White House and Buckingham Palace, Acquisitions are pleased to offer everything from private commissions to competitively priced models. Acquisitions has an extensive list of well known clients, as can be seen below. Catering for every taste and setting, Acquisitions of London are also the leading manufacturer of flueless wall-mounted fires with our range of contemporary X-FIRES, and produce a beautiful collection of British-made multi-fuel and gas stoves. With endless streams of electric fires now being released in the almost mundane black glass and landscape style, Costa Fires have gone against the grain and released the new Shimmer hang on the wall electric fire. Shown left is the Costa Shimmer in the stylish red glass fascia and with only 118mm total depth means this fire is more slimline than others on the market. Also available in black glass and a ultra stylish tinted glass mirror finish. Offering up to 2kW of heat output and manual control, this fire is ideal for those wanting a stylish electric fire that will provide a quick boost of heat was required. 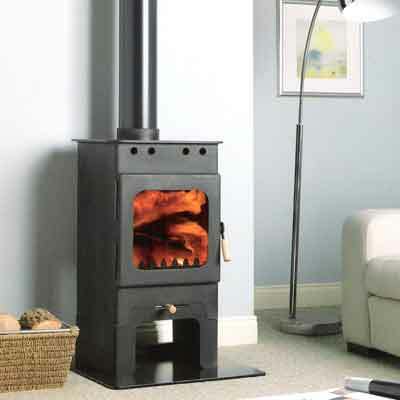 Not only stylish and powerful but the Costa Fires Shimmer also appears to be very affordable, We found it for £195 @ Fireworld including VAT & Free delivery. Ideal when you consider you can look at paying up to and over £1000 for an electric fire with the same heat output. 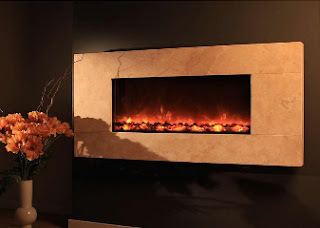 We've previously reported the Flamerite had released the Flame Essence Iona as well as a number of other incredibly slim inset electric fires and suites. These have proved so popular of the last 12 months, that Flamerite have released these fires for sale online. The Flamerite Iona, Flamerite Bailey and Flamerite Addison feature the new ultra-realistic Solar Flare flame effect and with an inset depth of just 18mm means that these fires will fit on a flat wall with any fireplace surround and the choice of styling ranging from traditional or contemporary. These fires have also been made available in a number of suites such as the Darcy, shown right, this suite is perfectly suited for smaller living spaces with small shelf width and shallow hearth to reduce the floorspace taken up. These suites are ideal, with a single 1500w heat output with hidden venting that is directed down so the heat circulates the room perfectly. The Construction Products Directive (CPD) is being replaced by the Construction Products Regulation (CPR) which means that CE marking will become mandatory in the UK. Manufacturers of solid fuel and biomass equipment will have until July 2013 to make sure their products meet the CE requirements of the new regulation. Andrew Hopton, head of standards and approvals for HETAS said: "We understand from the UK government that the CPR will apply fully from July 1st next year. From that date any products covered by a harmonised European standard must have a Declaration of Performance and be CE marked to be placed on the European market. "Products which are already HETAS approved will automatically meet the new CPR requirements as they are tested to one of the five existing harmonised European standards which cover stoves, stoves inset, boilers up to 2 bar, cookers and pellet stoves. The exception is freestanding biomass boilers because BSEN303-5 is not yet harmonised." Manufacturers, importers and distributors will need to be aware of the changes and act accordingly if their products do not meet the new CPR requirements. After July 1st 2013 it will be illegal to sell any products covered by the harmonized European standards which are not tested and CE marked. Why yes, officer, that is a wood-burning stove in my glove box.It's hard to imagine what led Pascal Prokop to install a wood-burning stove in his 1990 Volvo 240 station wagon. Though we're safe to say that the trend won't catch like wildfire. 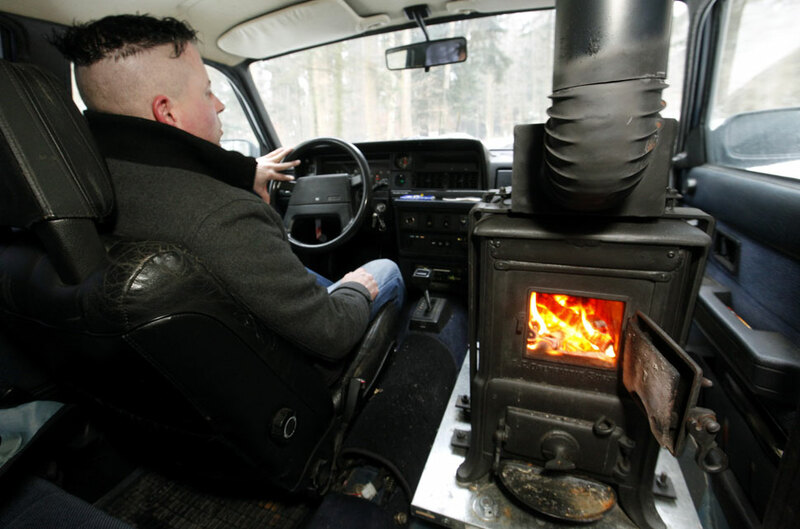 When his Volvo's heater broke, Pascal Prokop took drastic action to avoid the bitter Swiss winter and installed a wood burning stove in the front of his car. Since traditional car heaters are proving ineffective in the bitter cold, Pascal Prokop has built a wood-burning stove in his car. He obtained an operating permit for his stove-car from the Swiss Technical Inspection Authority, making it perfectly legal to operate. 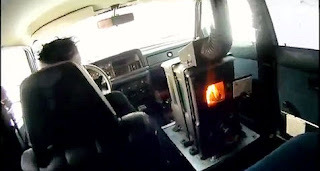 He has taken the passenger seat out of the vehicle in order to accommodate the massive heating device and added a chimney to prevent carbon monoxide poisoning from being a problem. You have to admire the ingenuity at work here and if he does get stuck in any traffic jams or suffers a breakdown, he doesn't have to worry about going cold. Prokop chose the stove over an electric heater since he can keep the stove burning long after the car is turned off. He told the German magazine Stern, "when I'm tired or have drunk too much, I want to sleep in the car." Calor Gas has again warned about the dangers of tampering with gas cylinders by people seeking to turn the cylinders into wood-burning stoves, barbecues or similar. This warning follows the death of a man last weekend, when an empty oil drum he was apparently trying to turn into a barbecue exploded at a house in Oxfordshire. It is believed the 48 year-old was fatally injured when the angle grinder he was using ignited fumes in the 40-gallon drum. The conversion of any vessel which has previously held flammable or explosive material is extremely dangerous. Calor has issued a number of warnings about the dangers of attempting to construct wood burners or barbecues from liquefied petroleum gas (LPG) cylinders. Calor is aware of a number of websites giving instructions on how to transform or deconstruct LPG cylinders, and has warned that it will take legal action against persistent offenders. However, in spite of repeated warnings, members of public are still posting messages on the internet advising other users about how to purge cylinders of gas. This is extremely dangerous. Paul Blacklock, head of strategy and corporate affairs, warned: "Although in this case it was an oil barrel, and not an LPG cylinder that exploded, it is alarming to see a rise in untrained people engaging in this type of activity, particularly during periods of improved weather. Advice on how to create wood-burning stoves or barbecues is widespread on the internet. This is not only dangerous, but unlawful. "Subsequently, we will be pursuing legal action against these websites and anyone who is found to be unlawfully tampering with Calor cylinders." Calor cylinders are used widely, whether at home, for leisure or at work, and the company says its safety record is exemplary. LPG cylinders are safe when used correctly, following the accompanying safety instructions. But LPG is a highly flammable material. If a welding torch or power cutter is used on an LPG cylinder, even if it appears to be empty, it can explode violently. As well as the safety implications of a potential gas explosion, tampering with LPG cylinders or attempting to change their use is an unlawful offence and could lead to a claim for damages or criminal prosecution. Earlier this year, the boss of a St Helens gas supply firm was fined £22,500 for causing multiple burns to both himself and one of his employees by attempting to remove a valve from an LPG cylinder. The Health & Safety Executive (HSE) inspector commented: "In this case, the fact that no-one was killed was simply down to luck." Irresponsible websites and publications encourage users to put their lives at risk, through step-by-step guides, and even videos, demonstrating how to de-construct or convert a cylinder. They have been repeatedly asked by Calor to remove their directions but many have not complied. A log processing business run by a husband and wife partnership has become the first in Cumbria to earn an industry charter mark. T J Ewbank, of Bolton, near Appleby, has received the HETAS Quality Assured Fuel Accreditation, which means it supplies firewood with a moisture content of less than 25 per cent. The business is owned by Thomas and Nicola Ewbank, who say they are delighted with the recognition. Since starting their firewood business in 2007, Thomas and Nicola Ewbank have worked hard to achieve consistent quality standards. Now their attention to detail, strict production control and excellent customer service has been recognised by the HETAS approval team. Mr Ewbank said: “We cut our logs and then store them to season naturally for over 12 months before selling them. “With more and more people now using environmentally friendly biomass boilers and woodburning stoves, customers can be assured of a consistently high quality wood fuel supply. Because trees absorb carbon dioxide as they grow, the wood fuel is considered carbon neutral. New measures to help protect the public from cowboy tradesmen have been introduced by the Department for Communities & Local Government. Tradesmen who operate under self-check schemes, which allow them to check their own work, will now be required to meet higher standards and prove they meet the right levels of quality. The government said this will give householders the peace of mind that work on their homes is up to scratch. This can be particularly helpful for those looking to have any building work including fitting a new boiler, fire or stove, as an incorrectly fitted item could be very dangerous. The measures will also ensure that householders have a financial safety net in place, such as a guarantee or insurance, to catch them if self-check installers fail to finish work properly or if they can't be chased through the courts. • be required to promote the membership and use of their schemes. Around 85,000 complaints are made currently about building work in homes each year according to the Office of Fair Trading. According to Communities Minister Andrew Stunell, today's proposals will further protect people from shoddy work and raise the bar for self-check tradesmen. He said: "Cowboy builders that leave behind a trail of shoddy work costing householders thousands to put right give the rest of the industry a bad name. We are determined to keep the cowboys from infecting self-check schemes, which let hardworking competent tradesman get on with providing high-quality work, quickly and at fair prices. "I'm determined to ensure that consumers are properly protected. By raising the bar even higher for self-check tradesman, we are sorting the rogues from the professionals, making it easier for people to identify competent installers and giving them the confidence that they will receive a high quality of work – or be protected if they don't." In the year to March 2011, Consumer Direct received 70,000 complaints from consumers about general home improvements, maintenance and repairs, and an additional 15,000 specifically about the window and conservatory glazing sector, according to a report prepared for the Office of Fair Trading. The heat output of wood burning and multifuel stoves is measured in kW. A kW is around 3400 BTU's. Some websites feature a kilowatt calculator which you can use to give you a guide to what the heat output of your stove should be - you simply enter in the dimensions and some basic information about your room. How is the Heat Output Measured? The manufacturer gets to specify the nominal heat ouput.